The Earth system changes continuously. 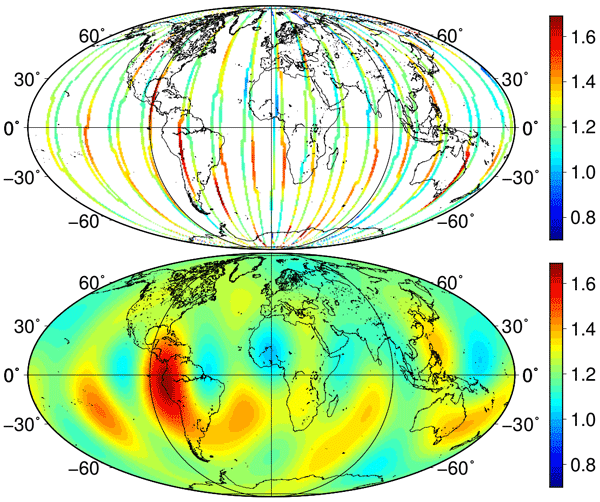 Variations in Earth’s interior, the atmosphere, the oceans, and near-Earth space give rise to changes in global fields, particularly in Earth’s magnetic and gravity fields. The underlying processes can be identified and studied through the monitoring and analysis of fundamental geomagnetic and gravity parameters. These are especially suitable to quantifying terrestrial transport mechanisms and solar--terrestrial interactions. This special issue solicits papers that build on data from satellites on low Earth orbits, such as CHAMP, GRACE, GOCE, and Swarm, the latter being of particular interest due to its multi-satellite constellation. In order to improve the understanding of interconnections and coupling processes, submissions are also welcome that bring in further sources of information, such as data from other satellite missions, ground-based observations, and empirical and physical models. Comparing Swarm GPS-only gravity fields to the ultra-precise GRACE K-Band gravity field schematic errors occurs around the geomagnetic equator. Due to the end of the GRACE mission, and the gap to the GRACE-FO mission, only Swarm can provide a continuous time series of gravity fields. We present different and assess different approaches to remove the schematic errors and thus improve the quality of the Swarm gravity fields. 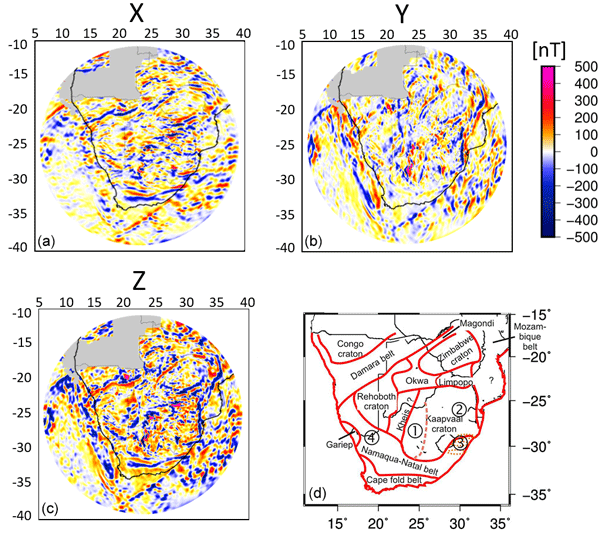 This paper presents a completely new method based on a new data analysis technique (ALIF) to determine both the environmental and instrumental backgrounds applied to all the DEMETER satellite electric and magnetic field data over L'Aquila's seismic region. 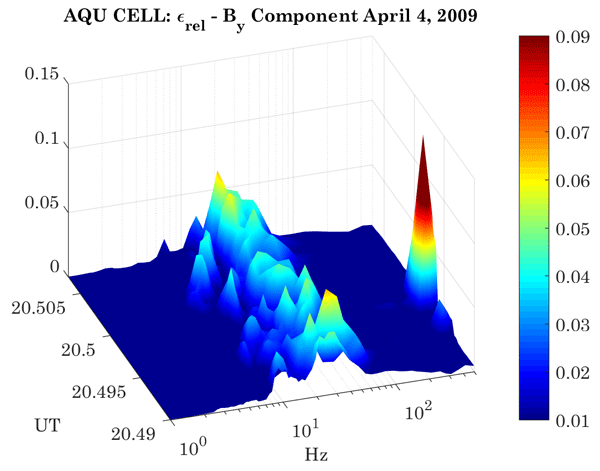 Interestingly, on 4 April 2009, when DEMETER flew exactly over L'Aquila at 20:29 UT, an anomalous signal was observed at 333 Hz on both the electric and magnetic field data, whose characteristics seem to be related to pre-seismic activity. The extraction of the magnetic signal induced by the oceanic M2 tide is typically based solely on the temporal periodicity of the signal. Here, we propose a system of tailored trial functions that additionally takes the spatial constraint into account that the sources of the signal are localized within the oceans. This construction requires knowledge of the underlying conductivity model but not of the inducing tidal current velocity. 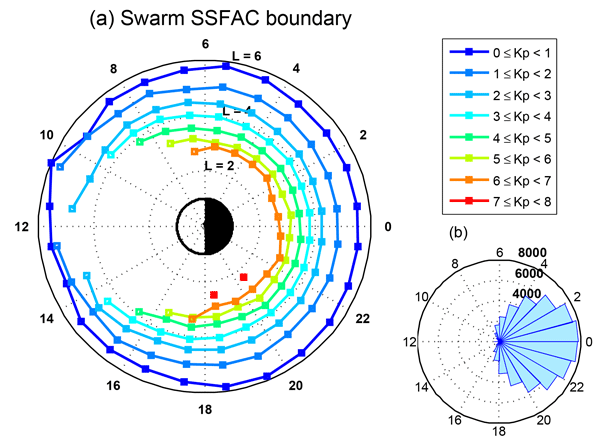 In this contribution, we analyse the performance of the Swarm onboard GPS receiver and present the approach for determination of the IfE Swarm kinematic orbit with PPP. The differences between our kinematic orbits and ESA reduced-dynamic orbits are at 1.5 cm, 1.5 cm and 2.5 cm level in along-track, cross-track and radial directions, respectively. A comparison with SLR underlines an accuracy of the kinematic orbits of 3–4 cm. By induction, ocean tides generate electromagnetic signals. Since the launch of magnetometer satellite missions, these signals are increasingly used to infer electromagnetic properties of the Earth. 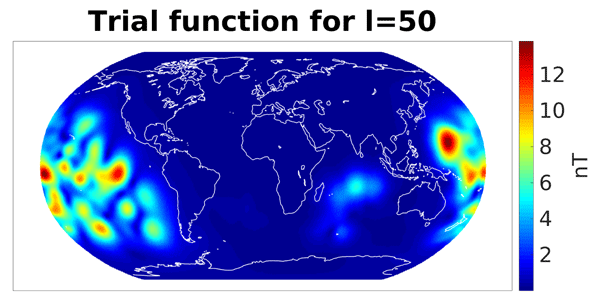 In many of these inversions, ocean tide models are used to estimate oceanic tidal electromagnetic signals which are generated via electromagnetic induction. This study's goal is to provide tide model errors for electromagnetic inversion studies. 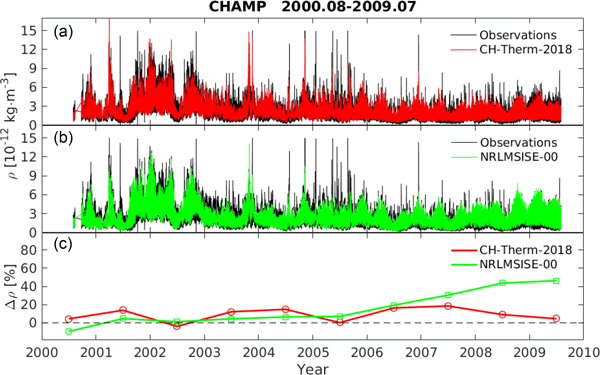 Based on comparisons of meteor radar measurements with HAMMONIA model simulations, we show that the differences exhibited by the semidiurnal solar tide (S2) observed at middle and high latitudes of the Northern Hemisphere between equinox times are mainly due to distinct behaviors of the migrating semidiurnal (SW2) and the non-migrating westward-propagating wave number 1 semidiurnal (SW1) tidal components. Atmospheric tides are produced by solar heating of the lower atmosphere. 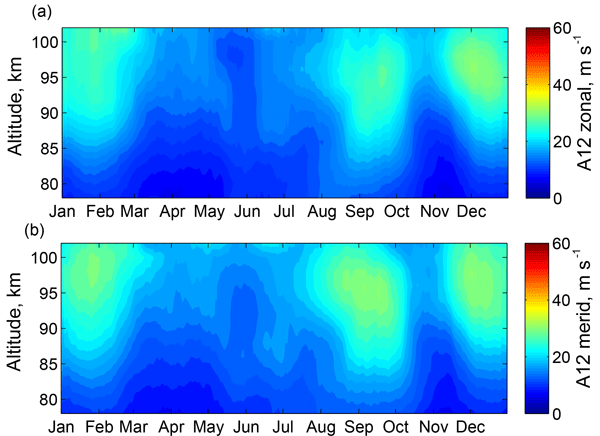 The tides propagate to the upper atmosphere and ionosphere playing an important role in the vertical coupling. 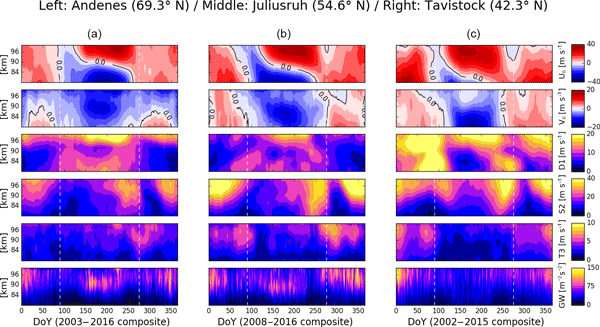 Ground radar measurements of the seasonal variability of tides are compared with global numerical simulations. The agreement with radar data and limitations of the numerical model are discussed. 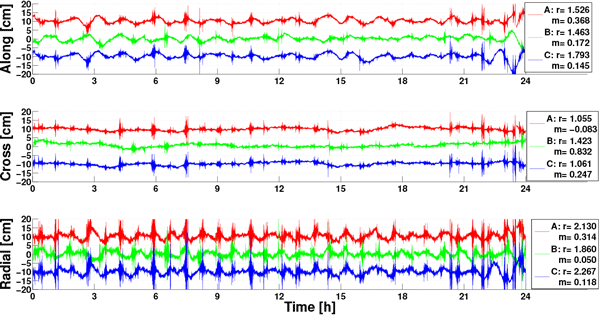 The work represents a first step in modelling the impact of tidal dynamics on the upper atmosphere and ionosphere. Swarm is the fourth Earth Explorer mission of the European Space Agency (ESA), launched on 23 November 2013. The mission provides an opportunity for better knowledge of the near-Earth electromagnetic environment. 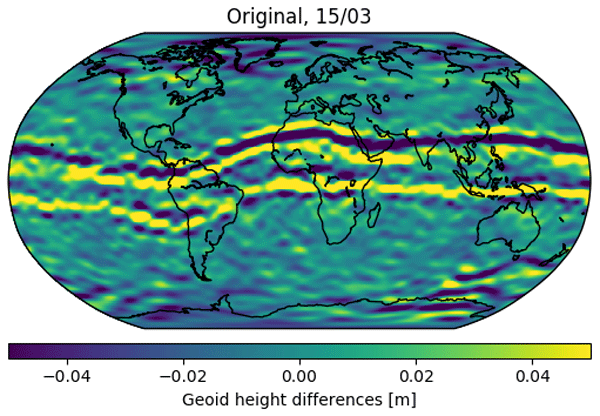 This study presents an initial attempt to derive an ultra low-frequency (ULF) wave index from low-Earth orbit satellite data. The technique can be potentially used to define a new product from the mission, the Swarm ULF wave index, which would be suitable for space weather applications.